top of the other since the thumbs lie on opposite sides of the “pancake”. 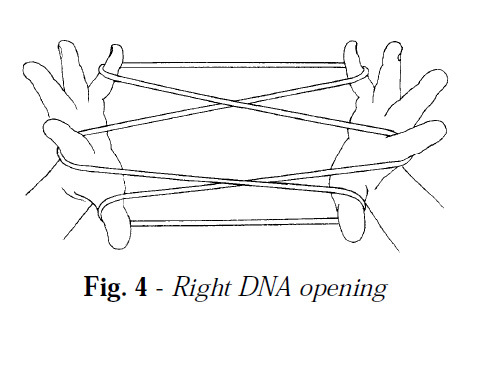 string taken up first) or a three-loop DNA opening. exploring chirality issues. Loop rotations are also reviewed in a later lesson. • Place both thumbs into the loop of string from below. 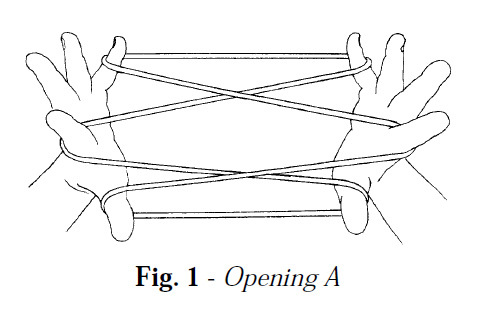 • Introduce the little fingers into the loop from below (this results in the formation of a palmar string). In the literature this stage in the formation of Opening A is called Position 1.
up the left palmar string and returns to position. • The left hand then reaches to the right palm, passes through the right index loop from above, picks up the right palmar string, and returns. The result is shown in fig. 1.
by the right hand. The result is shown in fig. 2. 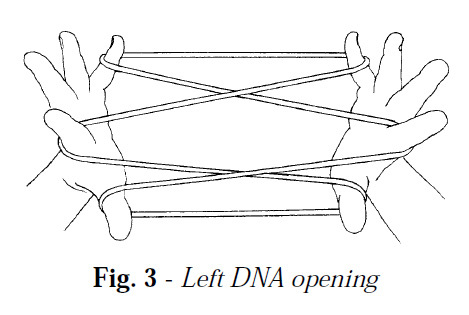 The only difference between Opening A and a 3-loop DNA loom is the parity of one or more string crossings. Also different is the way the loom is built: rather than starting with Position 1, a DNA loom starts with a single loop on each little finger. I call it a DNA loom because of the way the strings form a spiral or double helix as loops are added to the hands. 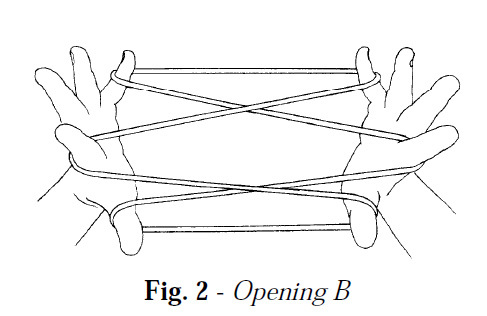 • Begin by placing the loop on each little finger so that the near and far strings are parallel and do not cross. • Create a second loop as follows: Insert the left thumb, from above, into the little finger loop and return with the near little finger string (rotate the left thumb toward you and up); insert the right thumb, from below, into the left thumb loop and extend. • On each hand transfer the thumb loop to the index finger. • Now create a third loop: Insert the left thumb, from above, into the index loop and return with the near index string (rotate the left thumb toward you and up); insert the right thumb, from below, into the left thumb loop and extend (fig. 3). To confirm that the loom is correctly formed, rotate your left hand 90° so that the fingers of your left hand point away from you. If none of the strings touch the loom was formed correctly. A Right DNA loom is formed in the same way, except the right thumb is used to create the second and third loops. The result is shown in fig. 4. To confirm that the loom is correctly formed, rotate your right hand 90° so that the fingers of your right hand point away from you. If none of the strings touch the loom was formed correctly. produce a wrap (a pair of interlocking strings) near the center of the figure.